This week we are featuring more amazing projects from the Craftupplies1 Design Team! The ladies on the team have really pulled out all the stops, and have come up with some creative ways to use our products. 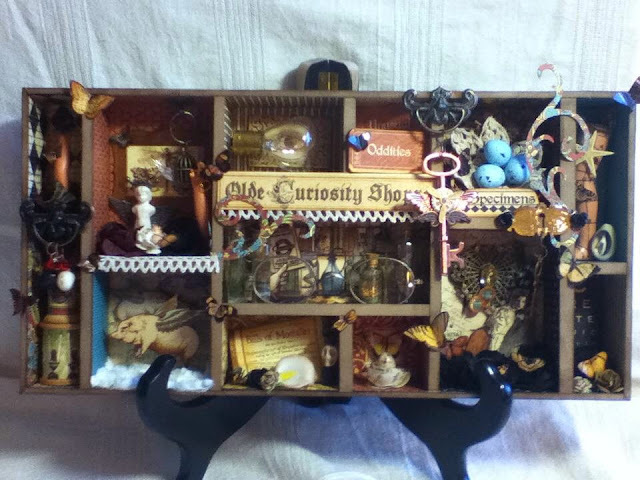 First up is Jennifer with a beautiful steampunk shadowbox along with a set of gorgeous cards as well. 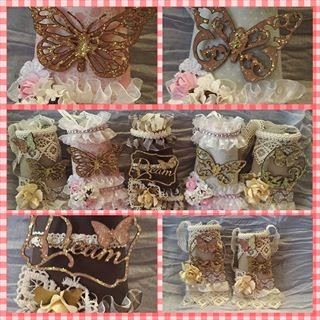 Next up is Kristina, who has created some really wonderful mini TP Tussie Mussies, just look at all this beauty! 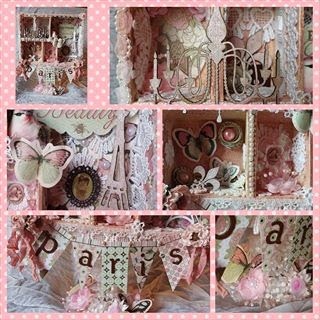 This is another project by Kristina we wish to feature this week, it is her Paris Shadowbox, its just so shabby and beautiful! 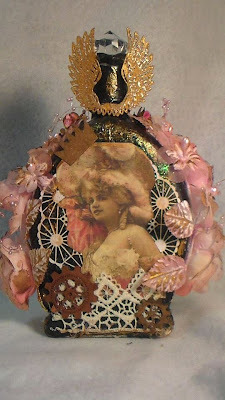 Heather has made this very pretty and unique Altered Bottle, we just love it! And last but not least we have Kim who has altered a Paper Mache Mailbox. Thanks to everyone on the Craftsupplies1 team and please check out Julie's two shops on Etsy and Zibbet. Next up is Mary with an inventive way to use our Love Wall Art Kit just by making a few simple adjustments. Hi everyone. Mary here and today I have designed a "lace" sign from Gina's Designs LOVE wall art kit! I plan on using it in my craft room to mark my lace area. When I have decided were that area will be, I will then make the decision on how I will attach it. For now I will just stand it up accordion style! I lined the back chipboard with paper from Prima's Delight after edging it with Walnut Stain. The corrugated squares were lightly touched with gesso. For the letters, I took the "O" and cut a small section from it to make a "C". After a coat of gesso and embossing with Madonna Robe Blue Gold, I turned the "V" upside down and attached the little piece left over to form the "A." The cutouts are from the paper line. I use a crocheted doily from my stash under the "A" and one of Gina's Designs under the "E". 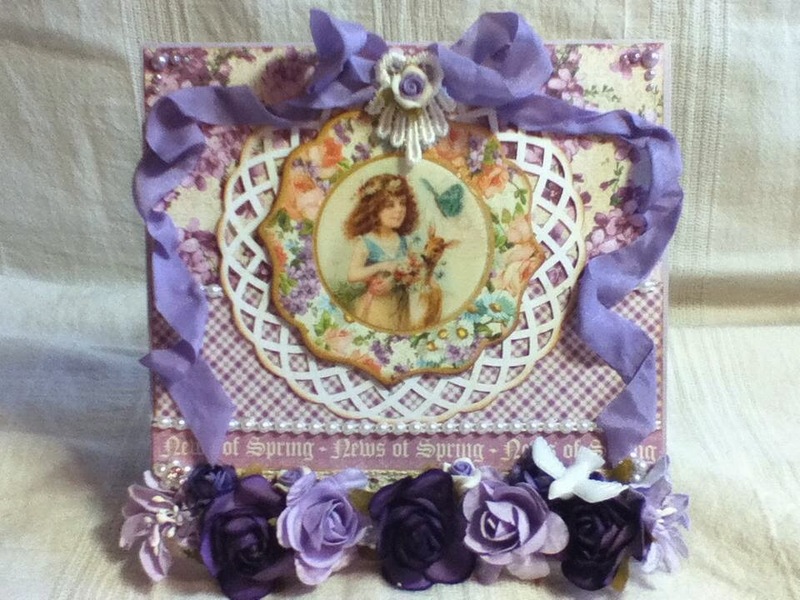 The panels were attached together with a lovely piece of lace from CraftSupplies1. I took out the ribbon that was woven through it. 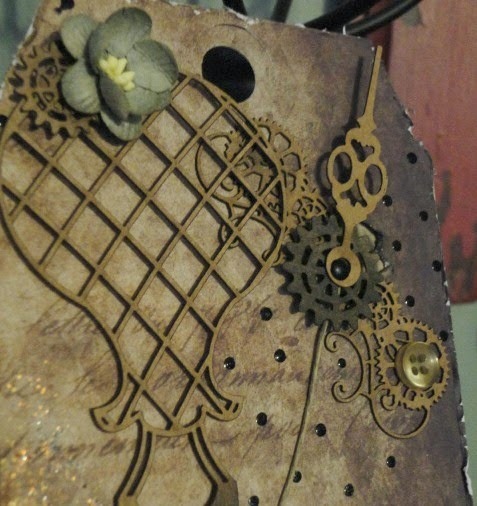 I then used one of my Tim Holtz Blending Tools and used it to drag the lace over the Antique Linen ink pad. All the metal flowers are from CraftSupplies1. For more information, please stop by my blog HERE! Butterflies with Bling: nail art. Every now and then we get a chance to highlight a product and show several different interpretations. Today we have three different visions using the Filmstrip Shadowbox. In a previous blog post Nancy shared her Nature Assemblage version of this product. Nancy used the box horizontally and gave it a very outdoorsy feel. This project features something new in every peek. Kathi's version of the Filmstrip box incorporates a vintage Hollywood feel. Kim's version of the Filmstrip shadowbox has an antique and shabby flavor, reminding me of collections that hung on the walls in my great grandmother's parlor. In this section of the shadowbox you can see one of Gina's chipboard cameras from the "Say Cheese" set. law's from one of the camera clubs he belonged to. used another camera piece from the Say Cheese Set. 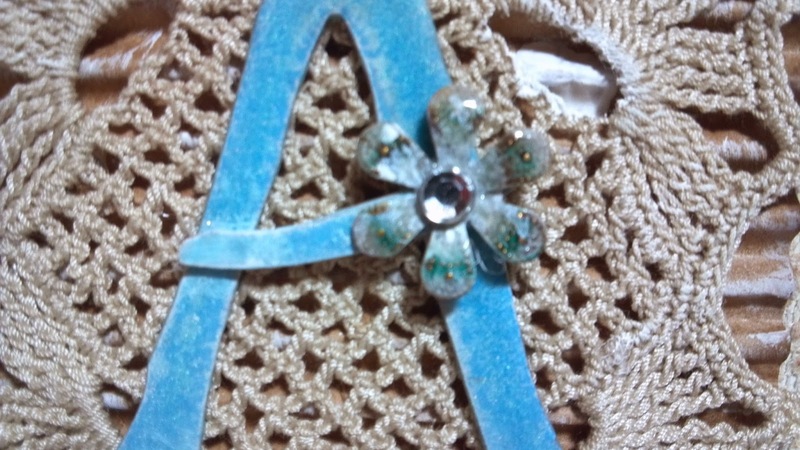 I used a cute little metal charm that looks like an old movie camera and more lovely flowers in black, blue and aqua. I hope you have enjoyed looking at my project today, thanks so much for stopping by! Hello Again everyone! Today we wanted to share more of the amazing projects that have been created by the Craftsupplies1 Design Team. They have really made our products shine and below here you will find some beautiful samples of their work. First up is Kim who has created these unique vintage looking luggage pieces from our book boxes. 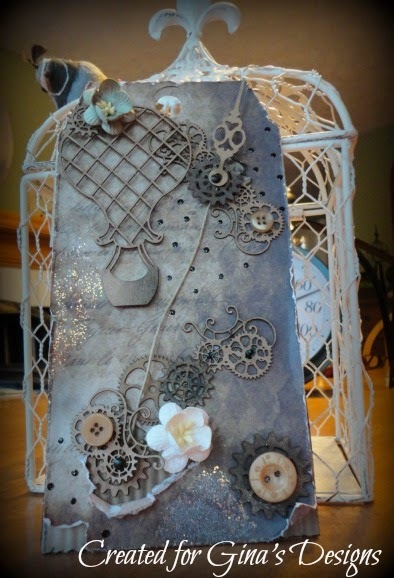 Next up we have Marla H. She has created some lovely little Chipboard Clipboards from our shop. 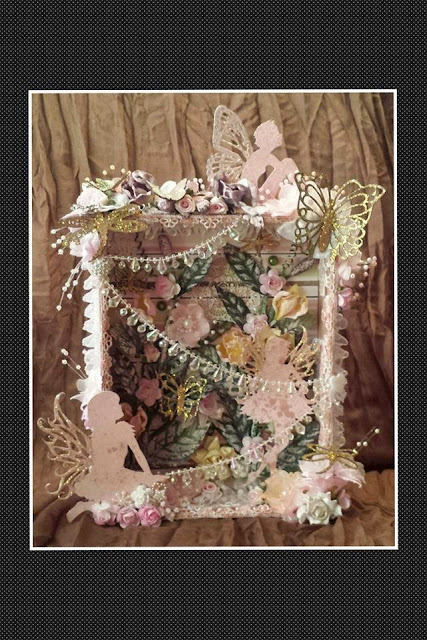 This is a beautiful Fairy Box created by Kristina. 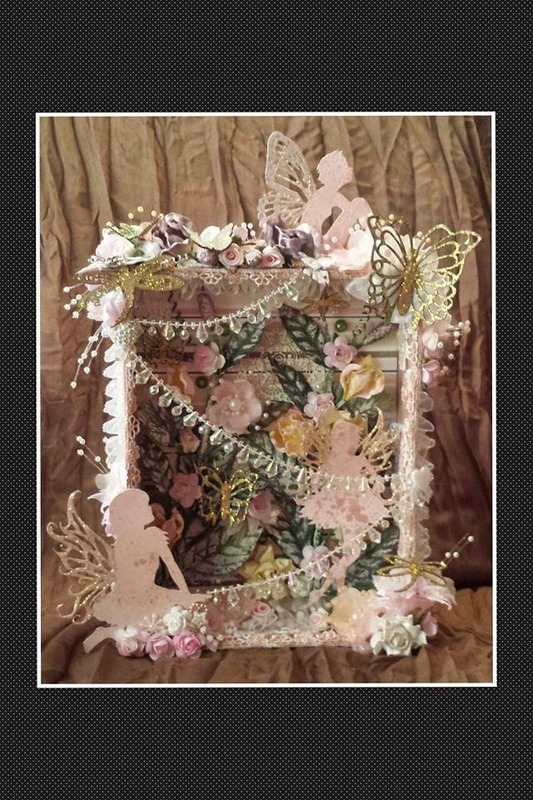 She has featured our Fairy Shapes in her shadowbox and done a wonderful job! Next up is Shanna with her take on our March Layout Challenge. Hey everyone. Shanna here. Have you stopped by to check out the challenge? You can do whatever you would like with the challenge. 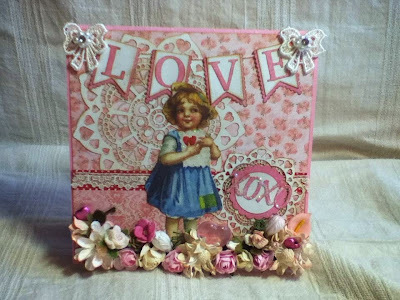 You can create a home decor piece, make some altered art, and you can do a layout too. I chose to play along with a layout. I am not going to lie I told the girl what the heck am I suppose to do.... I had some ideas and lots of stuff all over the floor trying to see it in my head. Finally this is what I came up with! For more photos and info check it out on my blog here! Next up "Take A Balloon Ride" with Heidi! Hello everyone, Heidi here. I just adore these large size chipboard tags so much, giving you lots of space to decorate and make a statement. I started this tag by taking a piece of kraft cardstock, crimping it and then tore a couple of spots in the top paper so that the "corrugated" paper shows through. I like doing this because then you can tear your paper and either stamp on that back piece or in this case, I put in a gear and then layered another layer of gears/buttons on top of it. 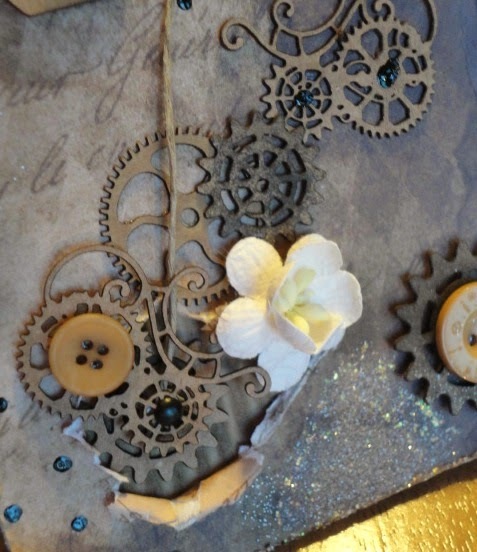 Then at the top of the tag I added a few more gears and tied them together. My thought in my head is that the gears are turning and the balloon is rising. Hi everyone, Nancy Here! Today I'm sharing this trinket box you can purchase at Gina's Designs. 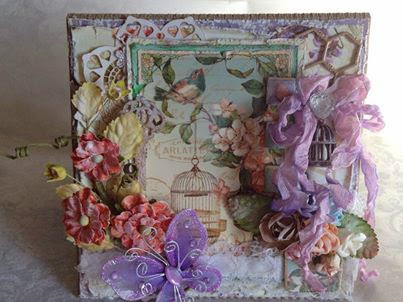 At a generous 7 inches square, this is a good sized box with lots of room for decorating and embellishing. I decorated the box as a pet memorial for my beloved Willie. It contains a cast of his paw print, a disk of photos, and a little kitty angel book signed by all of the doctors and staff at the veterinary cancer care center after his passing. I treasure this box, and every memory it holds. The embellishments are mainly flowers and some pearl sprigs from CraftSupplies1. I crackle painted the box and added Tim Holtz feet. The corners and the frame around the photo are from Gina's Designs. The resin bridge is by Prima. Hi, it's Melissa here with a layout using Gina's Designs Lasercuts, and items from Craftsupplies 1. In this project I wanted my layout to reflect the detail of the photo. I began by painting watercolor paper with watercolors to get a soft and delicate look. I added texture paste, and used the same paint. I also applied Twinkling H20s, and art deco pen ink. I like how well the chipboard complements the era. I especially like the fan, and how it gives a very feminine touch to the page. Hi there, it's Kathi here sharing another of our cross promotional projects with CraftSupplies1. I created my spool using many of the available steampunk shapes from Gina's store. I covered the spool with Graphic45 Steampunk design paper. I really love this paper, and I stayed with the color scheme of black, teal, and ivory. For the base of the clock, I re purposed the face of a large broken clock, and also used the hands of the clock on the side of the spool. Hi everybody, Nancy here! Today I'm sharing one of my favorite themes again. Nature! Somehow for me, it's the theme that comes most easily, and gives me the most pleasure in creating. I began with a simple application of gesso to the frame, then streaked it with some various colors of Folk Art acrylic paints. When the paint was dry I added some Kroma Crackle. This crackle product can take a couple of days to "cure" and finish crackling, so I just leave it and move on to other projects. When it fully "cured", I rubbed on some Prima chalk inks in various colors to bring out the crackled finish. I found a nature collage style of design paper in my stash, and I secured it to the back of the canvas with mod podge. Now comes the fun part. I began to gather my chippies and to ink, emboss and crackle them. I looked through my "nature" stash and found nests, birds, eggs and mosses. After that it only took an hour or so to decide on my final arrangement and to adhere the pieces to the canvas. Coloring the Topiary: I began with a light dry brushing of gesso followed by Prima Chalk Ink. I "shaded" the pot by leaving the thinly coated white gesso uncolored in the center to give it a rounded look. For the topiary, after I colored with shades of green chalk ink, I added some clear glass bead gel and left it to dry. It will dry clear. At that point you will have lots of texture from the beads that will be stuck to the chipboard. I then rubbed on some Gilders Paste in Vertigris over the beads and along the edges. Done! Hi everyone, Kim here! Today I'd like to share a very special creation. This is the Standing Dome Frame in an Oval Shape. I have used a vintage photo of my lovely Grandmother, Margaret. She was the one who first introduced me to crafting. I think she would be thrilled to be featured on Gina's Blog, and it makes me smile every time I think about it. This frame comes with a stand and also with some gorgeous picket fencing. 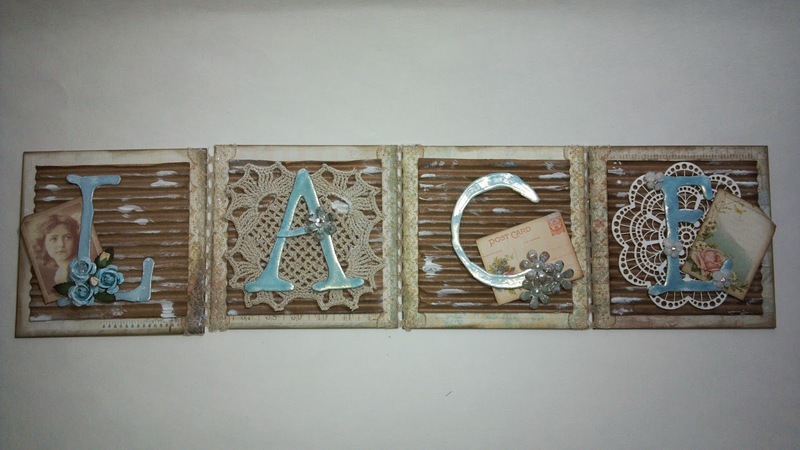 I have spelled out my Grandmothers name with some lovely scrabble tiles from Which Craft, and added some white floral lace to the front of the fence. Above you can see one of our skeleton clocks, and a lovely wooden dress form from Which Craft. I cut out some of the shutters from the Bo Bunny "The Avenues" paper line, and added a metal pocket watch. Above you can see the Birds on a Wire sitting on the fence. I embossed them with shabby white embossing powder. In the area behind the fence, I have used some gorgeous flowers from Craftsupplies1 in a lovely sky blue color. I also added the clock paper from the Bo Bunny paper here and then I topped it off with some rosette trims. And Finally here is a shot of the lamp post with the Large Round Charm hanging from it. 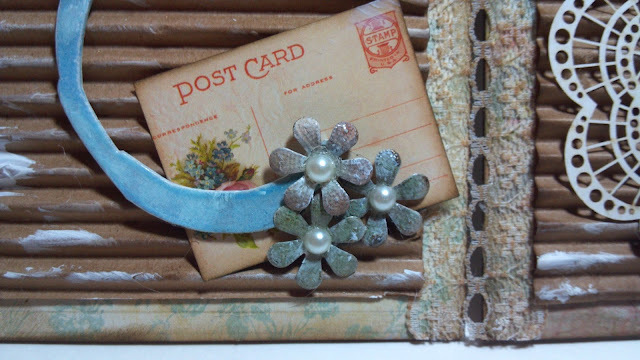 I used some metal embellishments from my stash and another lovely flower from Craftsupplies1. I embossed the lamp post with aged silver embossing powder. On the wooden charm, I added a bit of aged gold embossing powder to give it some interest. The birds on the inside were cut from the paper line and glossy accents were applied over top of it. You can see in the background another shutter I cut out of the paper, and topped with a wood sentiment from Which Craft. Wood Dressform, Scrabble Tiles and Forever Sentiment by WhichCraftdoyoudo? Today we are pleased to announce our March cross-promotional with CraftSupplies1, an Etsy shop featuring laces, flowers, metals, and other embellishments. This month, the Design Team members from Gina's Designs, and from CraftSupplies1, will be creating two projects each showcasing products from both companies. Watch for these projects all throughout the month. 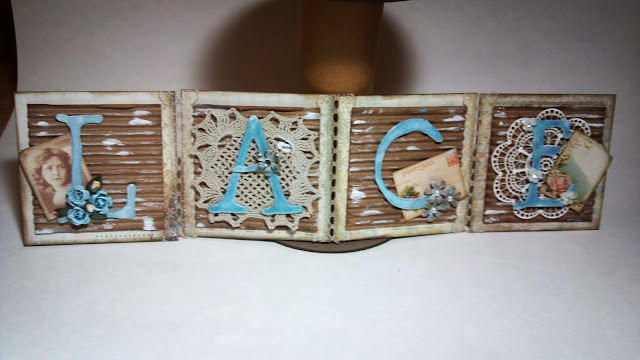 Hi Everyone, It's Kim here sharing my latest project, the Postage Stamp Shadowbox, from Gina's Designs. This is really a unique design! I loved altering it and giving it some vintage flair. 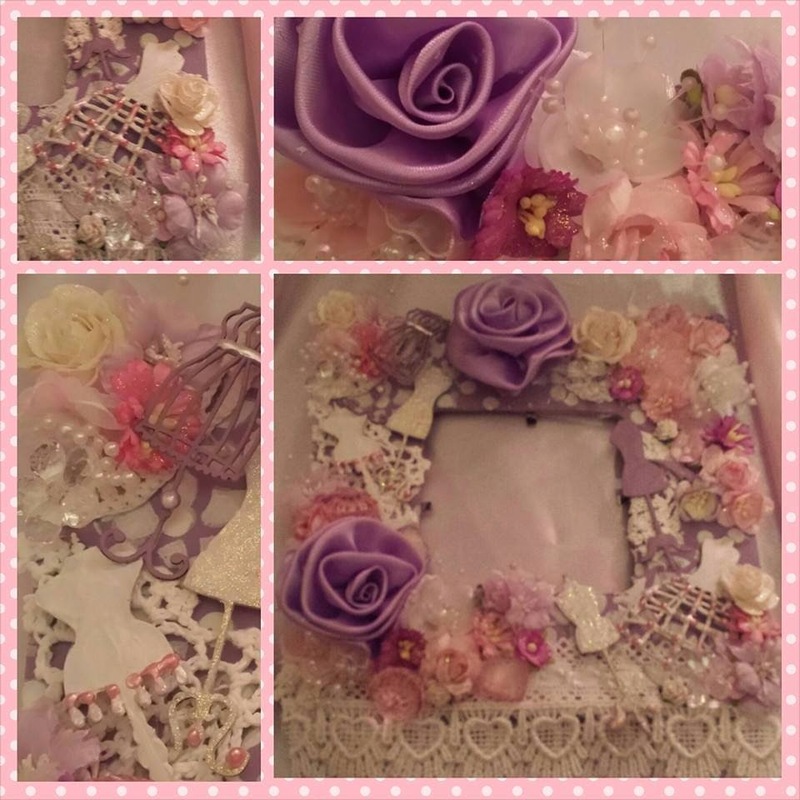 I have used a good mix of Gina's Designs Pieces in this shadow box and also mixed in some great Craftsupplies1 metal and laces and flowers which really added to the project. In this section of the shadow box I used some wood letters from my stash coming out of the Waterworks Tap and inside the box you can see one of Gina's Postage Frames, topped off with a wooden dress form from Which Craft and metal wing from my stash. The bottom corner is finished off with some more beautiful flowers from Craftsupplies1. And lastly, here is a shot of some of the gorgeous lace I have used from Craftsupplies1. Julie, the owner has some truly beautiful Venice trims in stock and this one I have used here is one of my favorites! 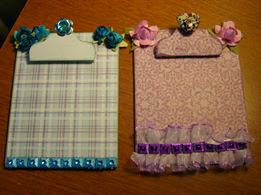 This is my first project for our Cross Promotion with Craftsupplies1. I hope you will go along and visit Julie's Store, and see all the wonderful goodies she has in stock!